This Friday, Main Street in Moorestown will be filled with 500 luminaries, the voices of street choirs, horse-drawn carriages and early shoppers, all in preparation for the upcoming holiday season. The Moorestown Business Association will be hosting its annual kick-off to the holiday shopping season with the 39th Candlelight Night on Nov. 6 from 5 p.m. to 9 p.m. on Main Street, featuring candlelit sidewalks, sounds of the season, special discounts and dinner specials. 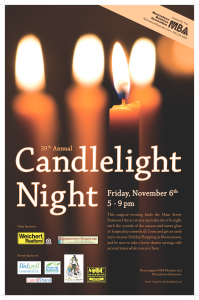 “(Candlelight Night) is a beautiful evening to appreciate what a wonderful community Moorestown is. Come out and see all the new things being offered. There are a lot of new merchants, and maybe you’ll notice things that you didn’t even know of before,” MBA Vice President and event chair Steven Pazienza said. Last year, Candlelight Night was held at the same time as the Christmas Tree Lighting in December. After suggestions by the shop owners on Main Street, Candlelight Night was changed to be held in early November. Hundreds of families are expected to be seen strolling along Main Street, stopping in candlelit stores, listening to cheerful sounds of the season and saying hello to neighbors. Storeowners and employees will greet visitors with hot cider, cookies and other treats. They were also encouraged to offer special discounts for the night. Restaurants were encouraged to have specials for the night as well. “This is a great way to get together and say hello and enjoy the evening. With new restaurants and stores, the event will be much nicer and there are more choices than ever before; it’s a great way for an early shopping start,” Pazienza said. This year, residents will see there have been a few changes compared to past years. One of the changes is keeping Main Street open to vehicular traffic, which will allow attendees to walk on the sidewalks closer to the shops and restaurants. There will also be no parking on Main Street after 4 p.m. to allow the businesses and luminaries to be better seen. Parking will be available behind the stores as well as on side streets. There will also be crossing guards at any crossings that don’t have a crossing sign to avoid accidents or injuries. “The goal is to make sure it is safe. Traffic will be very slow … anyone who is in a hurry should avoid Main Street,” Pazienza said. To help with the atmosphere of the event, the north side of Main Street will be lined with 500 luminaries along the sidewalk. “(The luminaries are for) ambiance. It’s nice to have some candles at Candlelight Night to have that atmosphere walking up and down the streets while enjoying our town,” Pazienza said. Another new addition is a “Find Nipper” Contest that will draw attendees into various stores looking for various “Nipper” dogs to earn the chance to win prizes. Perkins Center for the Arts and The Cubby Hole will be partnering to hold an Open Mic Night from 7 p.m. to 9 p.m. that night as well. The event will feature conservatory students from the Perkins Center program along with two hours of performance slots open to the public. A portion of the night’s profits will be donated to the Perkins Center. For more on that, visit the website perkinsarts.org/openmic. For more information on Candlelight Night, visit www.MoorestownBusiness.org.